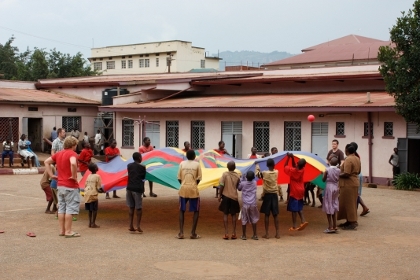 Our first links with Mbale started in 1986, but in the 1990's we connected with two exemplary projects that were already operating; the Joy Hospice (established by Dr Jan White) and the street kids Child Restoration Outreach (CRO) directed by Christine Kamiti. We have endeavoured to bring some support to both projects, delivering medicines & supplies to the hospice (collected by medics in the Lothians) & small financial gifts to CRO. We have on ten occasions met with the staff of CRO to bring encouragement & input, & organised games etc with the kids; we are told this has been greatly appreciated. We would like to continue this support.